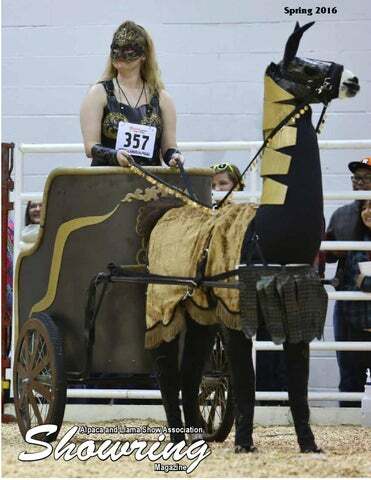 About the cover…….. Kayla Rogers of Madera, California, stole the show at the 2016 Houston Llama Show. Kayla said she and Joy Pedroni where kicking around ideas for the costume class and the idea of a Gladiator came up. Now they had to figure out how to build it. This is where Ron Pedroni came in. He took a driving cart frame and cut it down to be able to make a chariot. The hard part was to make sure the chariot had the proper balance. Kayla and Joy took on the job of making the costume. Kayla has been showing llamas all her life and is an ALSA Superior youth in Obstacle, Public Relations and Pack. Kayla wants to be a veterinarian and specialize in camelids. www.ALSAShow.org Here is a list and information below of the committee liaisons as of December , 2015. ALSA Committee members are selected by the Chair of the Committee and serve a one year term starting July 1 of the current year. The Committee Chair is selected by the BOD liaison of the Committee and also serves a one year term starting July 1st of the current year. The exception to this is the Regional, Grand National, and Fiber Committees which serve a one year term starting December 1st of the current year - following the conclusion of the Regional and National shows of that year. As Committees are selected, it is recommended that members are diversified as to their geographic regions to offer complete membership representation. Committee Chairs should submit a Committee Report to their BOD liaison for each month’s BOD meeting after it has been approved by all their committee members. (Minutes 8-15-06) Recommendations from committees are to be a consensus of the majority of Committee members, not just the opinion of the Chair. It is helpful for the BOD to even include the total votes (not names) of the Committee members on an issue in your report. As they say April showers bring May flowers, it sure seems strange to look out the window and instead of seeing green grass it is white and feels like the dead of winter again. While the New Year of show season has started and many people have already had lots of fun with their friends and animals at the show, ALSA has been busy with preparations for the Grand Nationals in Hutchinson, Kansas in October as well as the day to day business of the association. Our election is over before it started with only 1 member receiving nominations to run for the Board and it is my pleasure to welcome Bill Feick to the Board. He starts his 3 year term July 1st and I’m sure he can’t wait to get started. I would like to thank our outgoing directors, Susan Leslie and Lauri Jones, for all the time and hard work they have put in to keeping ALSA the premier show association. It has been a pleasure and an honor to work with you in this endeavor. Thank you. As always the board is here to work for you, our members. If you have any questions or concern, please don’t hesitate to contact any of the directors. Our names and numbers are posted on our web site for all to see. I hope your 2016 is going well and you are in full swing with your Llamas and Alpacas! I’ve seen many photos of you all this year showing your lamas, doing PR work with your lamas, packing with your lamas, making wonderful fleece items with your lama’s wool, and JUST HAVING FUN! Boy – there are many things we can do with our lamas! So – now down to ALSA office business: As of today, April 26, 2016 we have 205 Regular Memberships, 145 Youth Memberships, and 112 LIFETIME Memberships. This makes the total 462 members. Last year at this time we had approximately 416 members. As you can see there is an upswing in membership – an increase of 46 members. We do receive renewals and new memberships daily! AND thank you for that! If you have not renewed or joined ALSA, please contact the ALSA office or follow these links: For an online form: https://alsashow.sitestreet.com/alsashoworg/secure/membform.html For a printable form: http://www.alsashow.net/printform2016.pdf We also have 50 shows on the ALSA calendar thus far for 2016. Last year at this time we had 42. That is an increase of 8 shows. You may find all of these shows on the ALSA website on the ALSA calendar here: http://www.alsashow.org/nshows2003.asp These shows include our 19th Annual ALSA Grand National Show on Oct. 28th – 30th held in Hutchinson Kansas. For more information about this show, please visit: http://www.alsashow.net/national.html We will be updating information on this page very soon! 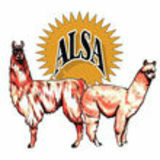 Showmanship are not what they should be, please contact the ALSA office at llamas@alsashow.org or call 281-516-1442. This is also a reminder for our Youth! Let’s make sure you get what you deserve, too! Usually at this time we are thinking about an upcoming election. I hope you all received the memo that was email blasted on April 18 from Lougene Baird concerning this, but in case you did not, here it is again: ALSA 2016 General Election Update The deadline for members to submit a Petition to Nominate Form was April 10th, 12:00 PM (noon) Eastern time. The Election Committee received ten Petitions for one possible candidate. The list of names of those who petitioned and the one member who received petitions were submitted to the ALSA office to verify that each was a member in good standing as of the Day of Record. All members on the list are in good standing. ALSA Bylaws ARTICLE III – Board of Directors, Section 6 Election (b) (last sentence) ……Candidates who are without competition shall be deemed elected. Bill Feick, being the sole ALSA member nominated by five or more Petitions from members in good standing, is the new Director according to the above ALSA Bylaw and has accepted the position. As of this time, there are no Bylaw issues to put before the membership. The 2016 General Election is closed. Regards, Lougene Baird, Chair ALSA Election Committee So we all welcome Bill! He will be an official BOD member in July 2016. If any of you have a question or concern, please feel free to contact me! I am available to help! Y’all have a great year and good luck with your showing! Offering two full ALSA sanctioned shows, including: Llama and Alpaca Halter Classes, Walking Fleece, Shorn Fleece and Finished Products Classes; Novice, Advanced, and Master Llama Performance; Novice Alpaca Performance; Youth Showmanship and Performance and lots of just-for-fun stuff. Information Packets and Entry Forms will be sent via e-mail. To make sure you are on the mailing list, please contact Cheryl Juntilla at cajwdj@aol.com, or call 970-640-8028. Many	of	you	who	remember	all	of	the	llamas	who	came	to	Colorado	from	the	MLAS	rescue	probably	also	remember	Big	Guy. He	was	the	llama	who	had	several	feet	of	fiber	dripping	off	of	him. He	was	estimated	to	be	about	25	years	old,	down	in	his	pasterns,	but	in	relatively	good	health. He	came	to	my	ranch	with	4	other	rescue	llamas	from	MLAS. They	fit	right	into	my	already	established	group	of	5. They	all	learned	to	help	care	for	my	sheep	and	how	to	act	appropriately	around	my	stock	dogs. Within	the	first	2	years,	I	lost	4	of	the	MLAS	llamas	to	various	ailments. Big	Guy	stood	strong. He	had	a	purpose	to	live.....to	care	for	a	large	flock	of	sheep. He	took	the	lead	role	with	each	and	every	sheep	trusting	him	completely. Big	Guy	led	the	sheep	out	every	morning	to	free-range	on	our	property	and	our	cow	pasture	a	1/2	mile	away. He	would	bring	the	sheep	home	every	night	before	dark. He	took	his	job	very	seriously	and	I	trusted	him	100%. He	chased	off	his	fair	share	of	coyotes,	bears	and	even	a	mountain	lion. Through	all	of	my	years	of	owning	llamas	and	sheep,	I	have	never	had	a	llama	like	Big	Guy. He	was	truly	one	of	a	kind. Unfortunately,	Big	Guy	said	his	final	goodbyes	this	afternoon. He	was	30	years	old. He	was	surrounded	by	his	companion	llama,	Jewel,	and	all	of	his	sheep. He	did	his	job	to	the	very	end. At	the	Houston	Livestock	Show	and	Rodeo	,	the	youth	have	the	opportunity	to	participate	in	a	special	program,	â&#x20AC;&#x153;Lloan-A-Llama.â&#x20AC;? This	event	is	open	to	youth,	5	years	old	and	in	kindergarten	through	18	years	of	age,	who	do	not	own	or	lease	a	llama	or	alpaca. The	Houston	Livestock	Show	and	Rodeo	Llama	Committee	organize	this	event	annually. This	contest	is	limited	to	those	youth,	who	are	not	showing	livestock. The	youth	have	to	submit	a	letter	saying	why	they	would	like	to	show	a	lama. They	have	to	lead	a	lama	through	an	obsticale	course	and	they	are	judged	by	the	ALSA	performance	rules. The	lamas	that	are	used	for	the	kids	are	provided	by	the	ranches	that	are	entered	into	the	Houston	llama	show. Owners	of	llamas	believe	them	to	be	the	ideal	creatures	to	provide	youngsters	a	first	encounter	with	animal	husbandry. Lloan-A-Llama	has	been	the	start	of	a	lot	of	kids	getting	involved	and	showing	llamas. The	good	news	to	the	lama	ranches	is	that	these	kids	buy	lamas. At	the	event,	an	awards	banquet	was	held	in	which	the	2015	SSLA	Sweepstakes	award	winners	were	announced. These	awards	recognize	the	top	llama	show	competitors	in	the	organization	during	the	past	year. Three	members	of	the	4-H	program	received	sweepstakes	awards	this	year. Cody	Avery	received	the	Grand	Champion	Special	Needs	Showmanship	and	Grand	Champion	Special	Needs	Performance	awards. Katelyn	Dutton	received	the	Reserve	Champion	Junior	Showmanship	and	Reserve	Champion	Junior	Youth	Performance	awards. Andie	Ellett	received	the	Reserve	Champion	Intermediate	Showmanship	and	Reserve	Champion	Intermediate	Youth	Performance	awards. Cody	Avery,	Andie	Ellett,	and	Elizabeth	Ingram	were	also	recognized	as	being	SSLA	Youth	Ambassadors	for	their	community	service	work	with	llamas. The Jackson County 4-H Love of Llamas youth participated in the City of Jefferson Annual Easter Egg Hunt and Carnival on Saturday, March 26, 2016 at the Jefferson Club House. The youth hosted a photo booth for the event along with a llama display and informational station. The youth love supporting their community and the llama industry by being active at local events. Moonlight Madness Performance Show June 25, 2016 - Glendora, CA Wally Baker Judge Join us at the Carlyle Linder Arena in Glendora for a day of fun competition and find out what your llama really thinks. Lydia Hiby will be at the arena before the show to communicate with your llama and you. The competition starts at 2pm Saturday June 25. We are offering novice, advanced and master performance classes. Show schedule -2pm starts with Youth Pack immediately followed by Youth Obstacle. Novice, Advanced and Master Pack Public Relations -Youth , Novice, Advanced and Master Obstacle – Novice, Advanced and Master Entry fees are $15 class for the ALSA show, plus $5 per llama ALSA fees. The LASC St Andrew Sir award will include points earned at this show. On the entry form mark Novice, Advanced, Masters or Youth. Dinner for $7 will be served during the show. You are welcome to dry camp for free at the arena Friday and Saturday nights. There is a bathroom but no shower. You need to provide your own pens or picket lines for llamas. Bring a canopy, sunscreen, and hats to keep cool. Don’t have a llama to show but would still like to participate? Contact Eileen -- she has several llamas which can be shown in novice OR if you’d like to try Advanced or Master, there are several you can show, even a couple of National Champions! Lydia Hiby Appointments: Beginning at 10am we are making appointments for 15 minute sessions with Lydia Hiby. The cost is $40/session. You can have multiple animals that you want to communicate with, but each will have a separate $40 session. Bring a recording device for your session -- you are going to want to remember everything she says. She will cover your llama’s health, temperament, and include things you didn’t even know your llama was thinking. My llama stared at me for a week after our first session. He wanted so badly to continue communicating with me. Check out her website www.LydiaHiby.com She will work with any animal if you have a dog, cat, etc you’d like to bring or not- as she will also do the session with a photograph of your pet. She’s accepting a max of 20 sessions, so sign up early! I will make a schedule with appointment times. Please mail to me a $40 check payable to Lydia Hiby to reserve your session. Mail to: Eileen Ditsler 217 Rodeo Court, San Dimas CA 91773 Sessions closer to show time I imagine will be most desired â&#x20AC;&#x201C; so sign up early. First come first served to appointment times. But the earlier you arrive at the arena, the more time you and your llamas have to relax! Appointment preference will be set by receipt of payment. I cannot guarantee there will any available appointment times available on the day of the show. I will be inviting some non-llama people interested in the event, but would really like to give priority to those showing. So please RSVP! On	March	5,	2016,	a	tragedy	occurred	at	Figment	Ranch	in	Cypress,	Texas	that	has	forever	changed	our	lives. On	that	date,	our	beloved	show	llama,	WLK	La	Tida,	was	brutally	tortured,	mutilated	and	ultimately	beheaded. When	our	guard	llama,	Lorenzo,	sensed	danger	in	the	pasture,	he	was	deliberately	shot	and	he	was	severely	wounded. Lorenzo	was	left	to	slowly	and	painfully	bleed	out	as	he	struggled	aimlessly	in	the	dirt. These	egregious	acts	have	sharply	penetrated	our	hearts	and	souls. We	are	struggling	today	as	we	know	we	will	struggle	in	the	endless	days	to	come. cruelty	affects	not	only	animals	but	jeopardizes	the	community	we	live	in. We	have	learned	there	is	overwhelming	evidence	that	animal	cruelty	is	linked	to	violent	crimes	against	people. As	a	result	of	this	type	of	evidence,	the	FBI	implemented	a	new	policy	on	January	1,	2016	requiring	law	enforcement	agencies	to	report	animal	cruelty	cases	to	the	National	Incident	Based	Reporting	System	(“NIBRS”). It	is	hoped	that	by	elevating	these	cases	to	the	federal	level,	shared	leads,	data	and	other	information	will	assist	in	the	local	prosecution	of	animal	cruelty	cases	such	as	that	suffered	by	Figment	Ranch. Many	of	the	procedures	we	adopted	earlier	at	Figment	Ranch	have	proven	invaluable	to	us	in	connection	with	the	investigation	of	this	matter. These	procedures	were	adopted	by	us	in	contemplation	of	natural	disasters	such	as	tornados,	hurricanes	and	floods	as	well	as	the	Tri-County	Fires	which	devastated	many	areas	near	us. We	never	contemplated,	however,	that	the	processes	we	adopted,	the	records	we	kept	up	to	date	and	relationships	we	had	built	in	the	community	would	assist	Figment	Ranch	as	a	victim	of	violent	crimes. By	sharing	these	general	procedures	with	you,	we	hope	it	will	help	you	implement	similar	processes	to	ensure	the	safety	and	welfare	of	your	own	animals. 1. 2. 3. 4.
speak	about	the	tragedy	which	has	befallen	it. Community	awareness. We	monitor	commercial	and	residential	growth	near	Figment	Ranch. We	have	an	established	relationship	with	a	local	realtor	and	we	have	formed	relationships	with	those	around	us. This	network	is	valuable	in	gathering	information,	keeping	a	watchful	eye	and	providing	support	when	needed. These	relationships	take	time	to	develop	and	may	change. However,	this	type	of	collaboration	can	yield	positive results	which	might	not	have	otherwise	been	available. Relationships	with	Local	Law	Enforcement. Having	updated	emergency	contact	numbers	which	are	easily	accessible	is	essential. When	at	all	possible,	it	is	important	to	establish	and	maintain	a	relationship	with	local	law	enforcement	as	your	community	develops. These	are	the	very	people	who	can	come	to	your	Ranch	quickly	and	provide	support	to	you. As	part	of	any	investigation,	it	is	critical	that	you	maintain	regular	contact	with	local	law	enforcement	and	provide	information	to	them	as	it	becomes	available	to	you. Although	it	may	appear	that	Figment	Ranch	is	well	prepared	to	manage	any	type	of	disaster	with	our	processes,	documentation	and	relationships,	the	truth	is	we	were	ill	prepared	as	human	beings	to	manage	the	loss	this	tragedy	has	brought	upon	us. No	matter	how	hard	we	work	during	the	day,	sleep	does	not	come	easy	at	night. Our	dreams	of	what	Figment	Ranch	could	be	some	day	have	been	replaced	with	nightmares	of	how	WLK	La	Tida	suffered	before	she	died	and	how	brutally	her	head	was	severed	while	she	struggled	to	flee. It	is	almost	as	if	we	can	hear	WLK	La	Tida	crying	and	Lorenzo,	our	guard	animal,	screaming	when	he	tried	to	help	her. Lorenzo	survived	and	he	has	been	returned	to	us. However,	Dr.	Ben	cannot	provide	any	guarantees	to	us	of	his	long	term	survival	because	of	his	injuries. Before	the	attack,	Lorenzo	was	curious,	proud	and	confident. Now,	he	is	timid,	subdued	and	he	avoids	people	in	general. Although	our	pasture	has	now	become	green	and	cool	under	the	trees,	the	llamas	have	not	returned	to	graze	in	it. They	sense	the	sadness	and	loss	of	their	companion,	WLK	La	Tida. “It	is	incomprehensible	how	anyone	could	allow	this	to	happen	to	an	animal,	they	rely	on	us	for	everything. Sadly	we	saw	evidence	that	a	third	alpaca	had	died	some	time	earlier. Their	heavy	fleece	is	a	burden	in	so	many	ways	and	could	well	lead	death.”	Local	alpaca	shearer,	John	Tully,	who	expertly	shore	Grace	and	Lauren,	trimmed	their	overgrown	toenails	and	administered	vaccinations	and	vitamin	shots,	estimates	the	alpacas	had	not	been	shorn	for	up	to	four	years. For	now,	the	girls	are	resting	comfortably	in	the	hospital	ward	at	the	sanctuary	where	they	are	preparing	to	walk	the	catwalk	to	their	forever	home,	no	doubt	turning	many	heads	and	hearts	along	the	way. What is Edgar’s Mission? Edgar’s	Mission	is	a	farm	animal	sanctuary	in	Lancefield,	Victoria,	around	one	hour’s	drive	from	Melbourne. How many animal’s live at Edgar’s Mission? How many have been rescued? The	sanctuary	is	currently	home	to	over	350	rescued	farm	animals,	due	to	the	fact	animals	could	possibly	arrive	or	be	rehomed	any	day	this	is	an	estimate. Since	2003	Edgar’s	Mission	has	provided	care	and	sanctuary	to	thousands	of	animals,	animals	able	to	be	rehomed	have	been	placed	with	suitable	forever	families. rescued	and	to	speak	up	for	those	who	cannot. Since	humble	beginnings,	Edgar’s	Mission	has	grown	rapidly	in	both	the	number	of	rescued	animals	and	public	support. We	believe	the	reason	so	many	people	support	what	we	do	is	because	they	connect	with	our	simple	message	of	kindness. Why farm animals? Humans	are	capable	of	such	compassion	and	kindness,	we	all	know	of	heroic	stories	men	of	and	women	risking	their	lives	to	save	a	drowning	dog	or	stopping	traffic	to	help	a	family	of	ducks	cross. When	we	see	a	creature	in	need,	we	can’t	help	but	help. The	problem	is	those	we	can’t	see. In	Australia	alone	there	are	around	500	million	animals	used	in	the	production	of	foods	and	fibres. These	farm	animals,	many	of	living	on	factory	farms,	only	see	sunshine,	smell	fresh	air	or	take	more	than	a	few	steps	on	one	day	of	their	lives	–	their	last. Chickens	and	pigs	are	often	crowded	into	concrete	pens	or	metal	cages,	unable	to	act	out	many	natural	behaviors,	like	foraging	and	stretching	their	limbs. While	dairy	cows	are	in	a	constant	pregnancy	cycle	and	their	calves	are	often	killed	at	only	a	few	days	old. This	is	allowed	to	happen	because	in	Australia	farm	animals	are	not	given	the	same	legal	protection	from	cruelty	as	other	animals,	despite	their	emotional	and	physical	similarities. For	example,	pigs	are	every	bit	as	smart	as	dogs,	yet	it’s	legal	to	castrate	them	and	cut	off	their	tails	without	pain	relief	or	anaesthetic. As	well	as	giving	rescued	animals	hope	and	lives	worth	living,	our	humane	education	and	outreach	programs	are	helping	raise	awareness	of	these	usually	hidden	animals. Simultaneously,	where	there	is	heightened	awareness	there	is	greater	compassion. More	and	more	people	are	coming	to	us	with	stories	of	personal	journeys,	to	offer	support	and	make	kinder	choices. People	are	driving	real	change	in	what	we’re	seeing	in	supermarkets,	the	media	and,	increasingly,	legislation. Using Composted Alpaca Manure In The Garden By Nikki Phipps (Author of The Bulb-o-licious Garden ) Although lower in organic matter than other traditional manures, alpaca manure has a lot of value in the garden. In fact, many gardeners find this type of manure to be an excellent source of nutrients for optimal soil and plant health. Let’s look at, “How do I use alpaca manure as fertilizer” and if alpaca manure is a good fertilizer. Is Alpaca Manure Good Fertilizer? Using alpaca manure as fertilizer is beneficial. Even with its lower organic content, alpaca manure is considered a rich soil conditioner. Alpaca fertilizer improves the soil quality and its ability to retain water. It is also good for plants, providing a fair amount of nitrogen  and potassium  and about average levels of phosphorus . Since alpaca manure is mostly found in pellet form and doesn’t have the same components as other livestock feeders, like cows  and horses , it does not need to be aged or composted before use. You can spread it directly onto garden plants without burning them. Best of all, it does not contain any weed seeds so there’s no worry about plucking sprouts from the garden following application, as with some types of manure. How Do I Use Alpaca Manure as Fertilizer? Generally, you can find bags of alpaca manure available from online retailers or alpaca farmers. Those raising alpacas can even obtain it straight from the source. When using alpaca fertilizer, you can put it on top of the garden soil and then water it or wait and let the rain help soak it in. For those in colder climates, you can also spread the manure over snow-filled garden beds and allow it to soak into the soil as the snow melts. Either way, alpaca manure breaks down rather quickly. Alpaca Fertilizer Tea Alpaca manure tea is another option for fertilizing garden plants. This is especially helpful for giving seedlings a jump start. Simply mix about a third cup of alpaca manure to every two-thirds cup of water and let it sit overnight. Then, use the manure tea to water your plants . Alpaca Manure Compost Although composting alpaca manure is not necessary, doing so is easy. Composted alpaca manure can offer additional benefits as well. One of the easiest ways to create alpaca manure compost is to simply mix it in with other organic materials. As with any compost pile, this is best accomplished by alternating layers of browns and greens â&#x20AC;&#x201D;browns being woody materials like small garden debris and leaves , and greens being kitchen scraps  like fruit peels, eggshells  , etc. This should be kept moist but not wet and turned occasionally. Depending on the amount of compost, it should take anywhere from a few weeks or months to a year before itâ&#x20AC;&#x2122;s ready for use. Adding worms to the pile  will help break everything down quicker in addition to lending their own nutritional value. The finished compost should have a pleasant odor and a nice dark brown to black color. Once added to the soil, composted alpaca manure can help increase crop yields and promote healthy, vigorous plant growth. Whether you add alpaca manure directly to the garden, make manure tea, or use alpaca manure compost, your plants will thrive. In addition, the nearly odorless alpaca fertilizer may even help deter deer pests, as they find its aroma offensive. ALSA BOD Meeting Minutes All the approved minutes of the ALSA Board of Directors meetings are posted for your viewing.